Match referee Hayden Bruce presents the player-of-the-match award to Swayline Williams. Leeward Islands decision to bat at Enmore backfired as they were reduced to 9-2 with both openers Jenisen Richards (01) and Malissa Howard (02) falling to Pearl Etienne. They never recovered from this position as Akeira Peters picked up the wickets of Jamella McClure (04) and Saneldo Willette (01), leaving Leeward Islands in further trouble at 21-4. Following the early inroads made by the new-ball pair, spinners Afy Fletcher and Swayline Williams combined to destroy the rest of the batting as they were bowled out for 50 in 18.3 overs. Amanda Edwards was the only batter to reach double figures with 11, while Rozel Liburd was the next best with nine as Williams finished with 3-13 from 3.3 overs, while Fletcher had 3-16 from four overs, Peters claimed 2-8 and Pearl Etienne had 2-12. Melicia Clarke removed openers Stacy-Ann Adams (01) and Rachel Francis (00) before Edwards accounted for Kimone Homer (00) as Windward Islands suffered an early scare in the chase at 19-3. However, Juliana Nero and Fletcher added an unbroken fourth wicket stand of 35 to see their team home as they finished on 54-3 in 21.1 overs. Nero struck four fours in a top score of 30, while Fletcher made eight. Melicia Clarke took 2-22 and Edwards 1-14. Swayline Williams was named player-of-the-match. Player-of-the-match Karishma Ramharack accepts her prize from Match Referee Arleigh Rutherford. At Everest, Trinidad and Tobago beat Jamaica by four wickets. Batting first, Jamaica were bowled out for 115 in 29.5 overs. 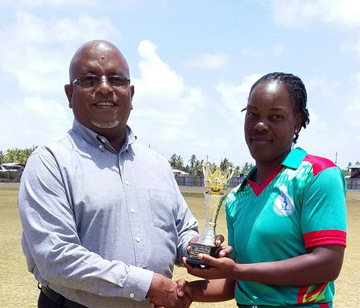 Tameka Sanford made 24 off 33 balls with one six, while Corrine Howell scored 22 off 25 balls including one four and two sixes, Natasha McLean got 17 and Chinelle Henry 11. Leandra Ramdeen picked up 4-35, Karishma Ramharack 3-19 and Anisa Mohammed 2-27. 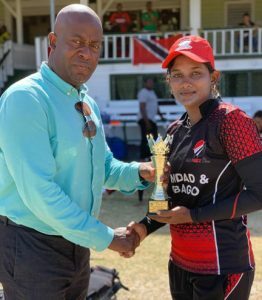 Trinidad and Tobago responded with 118-6 in 34.3 overs. Lee Ann Kirby struck six fours in a top score of 39 not out from 49 balls, while Reniece Boyce made 31 not out from 42 balls with five fours. The pair put on an unbroken seven-wicket stand of 67 to steady the chase after Trinidad and Tobago were reduced to 38-5. Felicia Walters supported with 19; Henry captured 3-18. Ramharack who was involved in nine dismissals, was named player-of-the-match.